The limited edition pink and white OtterBox “Strength” cases for BlackBerry smartphones, which benefit the Avon Breast Cancer Crusade, now cover the new BlackBerry Curve 3G and BlackBerry Curve 8500 series smartphones. Offering stylish protection that supports a great cause, the OtterBox Commuter Series “Strength” case for BlackBerry Curve smartphones accommodates both the BlackBerry Curve 3G and BlackBerry Curve 8500 series smartphones. OtterBox donates 10% of the purchase price from each “Strength” case back to the Avon Breast Cancer Crusade to support research to find a cure for breast cancer and programs that provide access to breast health care, regardless of a person’s ability to pay. The Commuter Series offers three innovative layers to safeguard your BlackBerry Curve smartphone. First, a self-adhering clear protective film safeguards the screen from scratches. Second, a durable white silicone mid-layer wraps around the smartphone to dissipate impact. Finally, a one-piece, custom-molded pink polycarbonate shell hugs tightly around the silicone. All buttons and features remain fully functional through the case. For more information, visit www.otterbox.com/strength or call 888-695-8820. 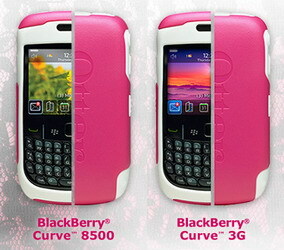 0 comments on "OtterBox Pink Strength Cases for BlackBerry Curve 3G and Curve 8500 series smartphones released"